Leading Exporter of slate carving murals - religious theme, decorative slate carving - ganesha, decorative slate buddha theme, poses of ganesha - decorative slate carving and slate stone carving - hand carved - village theme from Hyderabad. 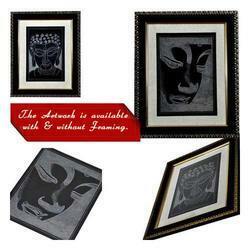 Our enterprise is devotionally engaged in manufacturing, trading and supplying a supreme quality Slate Carving - Murals. Our offered product is design using premium quality material keeping in mind the market trends. This product is known for their unique appearance and different designs. In addition, we are benefiting our customers by providing this product in customization options. Being the well-established enterprise, we are offering a wide range of Decorative Slate Carving. 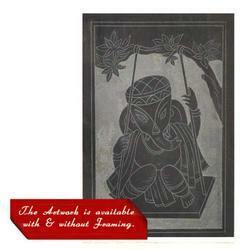 These slate paintings are designed as per the set market norms by our experts using high quality material and ultramodern techniques. 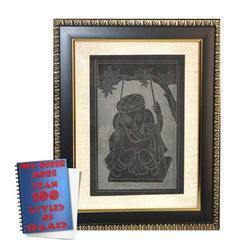 We offer our slate paintings in varied designs & frame styles as per the need of customers. 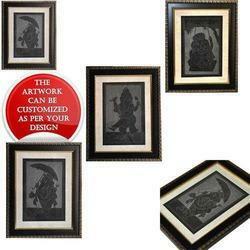 Our slate paintings are provided in quality packaging so as to maintain its defect free range at customer’s end. We are backed by the team of skilled professionals, offering a quality array of Decorative Slate Paintings. The Decorative Slate Paintings are designed under the strict guidelines of the professionals, as they have advance knowledge of domain. Moreover, these products are available in various sizes. Backed by a diligent team of professionals, we have been able to offer high quality assortment of Decorative Slate Paintings. 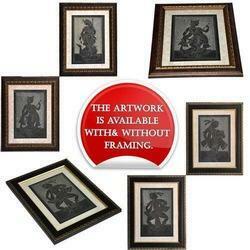 These paintings are acclaimed in the market for their excellent finish & quality. We design these paintings from top grade material by employing latest techniques. Our offered paintings are available from us in various frames styles & sizes at pocket friendly prices. Looking for Slate Carving Art ?